Several Pace students showcased their work at the Georgia High School Ceramic Arts Awards and Symposium on March 18-24 at Piedmont College in Demorest, Georgia. 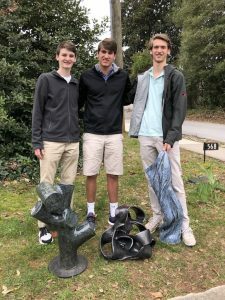 The works of seniors Ben Bernstein, Isaiah Kelly, Zoe Malloy and Justin Morris, as well as juniors Lawson Stricker, Drew Schiffer and Billy Snyder and sophomore Ryan Kann were chosen to be displayed at the highly selective exhibit. Of over 500 ceramic pieces submitted for consideration from across the state, only about 100 were chosen for display. On March 24, the last day of the exhibit, several Pace students attended the symposium where they participated in technique workshops led by a variety of professionals. Visual and Performing Arts teacher France Dorman conducted the Raku workshop along with Andy Cunningham from Woodward Academy. Other workshops included printmaking with clay, working with the cup form and brush making along with several others.